Mobile attribution is essential for optimizing user acquisition and re-engagement efforts and results. An Attribution Model is a rule, or set of rules, used to determine how credit for an event is assigned to touchpoints in conversion paths. All players in the mobile marketing ecosystem, from Google Play and iTunes, to ad networks such as Facebook and Twitter and onto the mobile measurement companies, have their own mobile attribution models. Therefore, by definition, all players count installs and events differently. This is why it is important to understand the attribution model of any relevant player you work with, and first of all AppsFlyer, the globally recognized mobile attribution authority. What is a Mobile App Install? AppsFlyer's attribution model states that an install is recorded only after the user downloads and launches the mobile app. Therefore, the time stamp of an app install is always the first launch. In contrast, ad networks regard the engagement time as the install time, while app stores use the download time. There are several different attribution methods AppsFlyer uses, depending on the device platform and availability. AppsFlyer uses the Google Play referrer parameter which delivers the original URL clicked before redirecting to Google Play. This is the primary method for Android and is only available if the Android app is stored in the Google Play Store and not on out-of-store markets. The ad network, which has access to the user's device, sends the device ID to AppsFlyer on the Click URL, or when notifying AppsFlyer an impression has been served. This allows AppsFlyer to match the click Device ID with the device's ID fetched by AppsFlyer's SDK. Device ID matching is the primary attribution method on iOS. Available IDs are IDFA or hashed Sha1 IDFA for iOS devices, and GAID or hashed Sha1 GAID for Google Play apps. Out of store Android markets use Android ID or IMEI device IDs for ID matching. Upon the first app launch, AppsFlyer checks whether the app is configured to receive traffic from several networks, which are called SRNs (Self-Reporting Networks). These networks include Facebook, Snapchat, Google Ads, Twitter, and a few more such networks. AppsFlyer queries all SRNs configured for the app, using the unique device ID of the new install. That is done via dedicated MMP (Mobile Measurement Partner) APIs, which SRNs enable AppsFlyer to use. Based on the returned answers, AppsFlyer can attribute new users to SRNs. The fingerprint is established and captured by gathering different parameters about the device. The fingerprinting information is first gathered at the time of the click. At the time of app launch, it is gathered again and matching is attempted. The information retrieved includes device-related parameters such as IP address and OS version. Fingerprinting is a statistical matching method, and not based on a unique ID. Therefore, it always loses to clicks with referrer or ID matching methods, if they also occur within the look back window. For the same reason, the attribution window for fingerprinting is much shorter than the other methods. 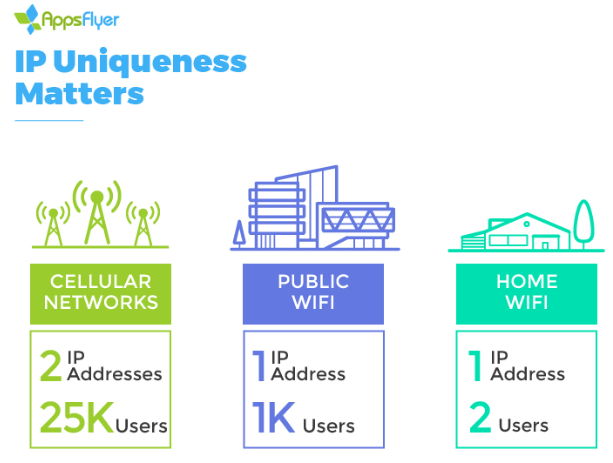 However, AppsFlyer determines the fingerprinting attribution window dynamically, based on the type of the user's network and the uniqueness of the IP address. The download + install + first launch occur within a short window from the commercial being aired. The user comes from the specific country (and optionally also a city) where the ad was aired. For more information on TV attribution, click here. AppsFlyer supports attributing app installs where the apps were installed on the device prior to the user purchasing the device. Since there is no preceding user engagement, click-through nor view-through, installations are attributed on the first launch using AppsFlyer's SDK API. For more details go here. AppsFlyer records and uses two types of different user engagement attribution types: Click-through and view-through. Click each item below to view the details. Most attributed mobile installs come from user clicks on ads: banners, videos, interstitials etc. Upon the ad click, AppsFlyer opens a click lookback window, which lasts 7 days by default. Installs occurring within the lookback window are considered as non-organic and are attributed to the media sources. Beyond the lookback window, they are considered as organic installs. AppsFlyer recommends using 7-day click lookback windows, which is the industry standard. However, you can customize the time period to 1-30 days based on the agreement you have with your media sources. For example, Facebook uses a 28-day click-through lookback window, Twitter uses 14 days and Google Ads uses 30 days. You can match AppsFlyer's click-through lookback window to any of these values. The click fingerprinting attribution lookback window is limited to a maximum of 24 hours on iOS, and a lot less on Android, to maintain a high level of accuracy. For more information about AppsFlyer's lookback windows, click here. New installs by users who have viewed mobile ads, but have not clicked on them, can be attributed to the ad networks that served the ads. The lookback window for view-through attribution, which is much shorter than for click-through attribution, is also configurable in the AppsFlyer dashboard. To enable the view-through attribution, you must select it in the configuration window. This is especially helpful for video ad networks that traditionally have low CTRs on their video ads, but also for traditional ad networks serving regular ads. In cases where both a click and an impression have occurred, the click always prevails, as it is an active engagement. For more information on View-Through Attribution, click here. AppsFlyer fully attributes only one media source per install, usually according to the last ad click or the last ad impression (if there were no clicks). Assisted Installs (AKA multi-touch attribution) are installs where the Media-Source/Campaign did not have the last touch, but did touch the user before the install and this took place within their attribution lookback window. The assisting networks get credit as contributors to the install on AppsFlyer's dashboard and raw data. The app was already installed, has been uninstalled and then re-installed after the re-attribution window from the original install date has passed. Re-installs within the re-attribution window are therefore not attributed to any media source, including organic. However, any performed in-app events by reinstalling devices are attributed to organic. For device testing and multiple installations, you must white list the device on AppsFlyer's database or else only the first install is recorded. To Whitelist a device for ongoing testing purposes, click here for more information. A user who re-installs an app within the re-attribution window (90 days by default) is considered a re-attribution and appears as such in the AppsFlyer Retargeting Dashboard, if acquired from a retargeting campaign. When existing users update their app, AppsFlyer does not consider them as new users, nor show it in any way on the dashboard. You can see the distribution of your new app versions and more on the SDK information page. The only exception to this rule is when an app, that has an active user base, first introduces AppsFlyer's SDK. When existing users update to the new version, which includes AppsFlyer's SDK, AppsFlyer shows them as new organic users.